What is a Mexican Chimenea? 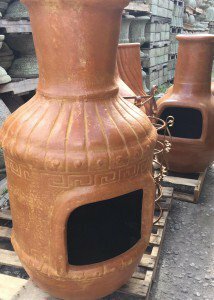 Posted on December 21, 2015 by Courtney Duerig / This entry was posted in Pottery, Pottery Trends and tagged chimeneas, clay, firepit, fireplace, grill, mexican chimeneas, mexico, outdoor fires. Bookmark the permalink. Not surprisingly, Chimenea is the Mexican word for “chimney” and also represents a hollow, bulb shaped outdoor fireplace. They are traditionally made from clay or terra-cotta and are held off the ground by an iron stand. The fire is lit in the “bulb” or rounded part of the chimenea which has an opening in the front, and the top forms a smoke stack or chimney. Chimeneas are special because unlike other outdoor fireplaces or fire pits, they keep the smoke away from the surrounding area. On cooler nights you can gather around the fire without worrying about the wind blowing smoke in your face. Chimeneas have been around for over 400 years and were influenced by Spanish culture in Mexico. They have been essential for domestic heating and cooking long before they were used for display or social gatherings as they often are today. They have also moved from traditionally being used indoors, to outdoors on patios and in back yards. The Chimeneas from Mexico come in many different designs and even fish shaped Chimeneas. To cook with a Chimeneas today, you can place a grill inside, above the fire. Below are some example videos of how to grill and make pizza with a Chimenea. Position the Chimenea outdoors, in the iron stand and clear of roots and trees. If you’re placing it on a wood deck, set it on top of some bricks or flagstone so the wood does not get scratched or damaged from embers. Before firing, place 3 to 4 inches of lava rock, sand or gravel inside the base of Chimenea to raise fire off clay bottom. You can use logs, wood scraps, or branches as fuel, and paper or wood tinder to start fire. Use matches or a fire starter to light the fire, never lighter fluid. Do not use charcoal or artificial logs in Chimeneas, they burn too hot and may cause the clay to crack. Always warm up the Chimenea slowly – First build a small fire, allowing the Chimenea to heat up for at least 20 minutes to avoid cracking. It is important to remember to never use a Chimenea if it is wet. Chimeneas are not frost proof. If a they become wet and freeze, they may crack. Do not fire your chimenea when the outside temperature is below 35 degrees. You may repair a crack in your Chimenea by applying a silicone sealant to both sides of the crack. Let it stand at least 24 hours before using. After a rainfall a natural white alkaline may appear on the clay. To clean, gently scrub surface with vinegar and a nylon brush. Rinse after the alkaline has dissolved. Cover the Chimenea with a tarp or you can purchase our Waterproof Chimenea Cover CH716. This is to prevent rainwater from collecting inside and sun which might cause peeling of the surface. The entire vessel will radiate heat. Keep children at a distance to avoid being burned. Do not touch the Chimenea once fired. Never leave a Chimenea unattended when in use, especially on wood deck.